While the word casket is often used interchangeably with coffin, there is an important difference between the two. A coffin is octagonal or hexagonal, while a casket is rectangular. Also, a casket often contains a split lid for the purpose of viewing the body, while a coffin does not.To learn more about our funeral services, please call JAMES H. DELANEY & SON FUNERAL HOME at 668-1960. We invite you to tour our home at 48 Common Street, where we have been faithfully serving our community for more than 50 years. A funeral can and should be as unique as the life that is being celebrated. Personalizing a funeral or memorial service can be very therapeutic--it gives you and your family something to concentrate on as you relive memories. 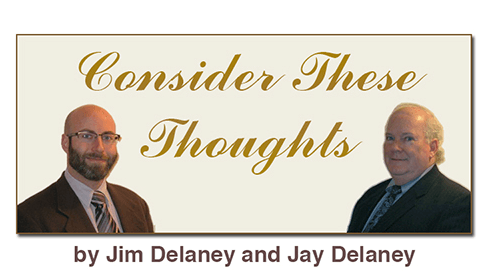 JAMES H. DELANEY & SON FUNERAL HOME offers a variety of ways for you to honor their life, pay tribute, and celebrate special memories as you begin to heal and find closure. To learn more, please call 668-1960, or visit us at 48 Common Street. We have been serving our community with pride for more than 50 years. While adult children may be wary of discussing death with their elderly parents, they may be surprised at how open seniors are about discussing their futures. It is often the case that older individuals have less fear of death and approach it more openly than their younger counterparts. Seniors may have this more positive approach toward death because they’re more aware of their own mortality and they think about death more often, discuss it more openly, and accept it more peacefully than other age groups. The elderly do not consider it morbid to discuss their own passing. Instead, they talk about burial and funeral arrangements as a means of squarely facing the close of life and taking charge of events. When it comes to her wedding, a bride chooses the dress she wants to wear to an occasion that won’t be forgotten by any who attend. Marrying couples also want to have their say when it comes to choosing the venue, flowers, food, and type of ceremony. These are personal details that cannot be left to others to decide for them. The same may be said of a funeral, a ceremony of equal importance; however, many people are reluctant to take control of their funerals in the same way that they plan weddings, birthdays, anniversaries, vacations, graduations, family reunions, and other momentous occasions. Preplanning your funeral enables everyone to make sure that you will be remembered exactly as you wish. The rituals and customs surrounding death, burial, or cremation demonstrate the universal urge to exert some degree of control over uncontrollable natural forces. Because it’s difficult to accept the reality of death, most of us like to believe that we can, at least, maintain some degree of control over the physical challenges that stretch between birth and death. Only through faith can we confront the ultimate mystery of existence without despair. There are many forms of faith, all of which promise some form of continued existence, from an exaggerated sense of worldly bliss to union with the Supreme Being. Within this promise is a glimpse of what we want to believe lies beyond the terrestrial realm awaiting humankind after death. When those we have loved have passed, we create a vision of them in our imaginations. Fortified as well as comforted by these images, we remember them and imagine their delight as we look into the eyes of their grandchildren and partake of the daily joys that they once found to be so pleasurable. Every time we light a candle, cook a favorite meal, visit a treasured destination, and meet with family, we have an opportunity to conjure up the image of a loved one who has passed and think of the many ways that he or she added to our appreciation of life. The dead provide the foundation upon which we live. Funeral prearrangement is a two-step process that involves making funeral arrangements as outlined in the preneed contract, followed by a discussion of the funding. During the first phase, a discussion will take place of services such as embalming and other preparations, providing funeral vehicles and transportation services, the funeral ceremony, and facilities for visitation. Decisions will also have to be made concerning the selection of a casket/urn, outer burial container, and other merchandise such as flowers, acknowledgment cards, and transfer containers. Finally, cost considerations may be finalized through life insurance, bank trust agreement, or other method. It is possible to select funeral goods and services without pre-funding the funeral, but cash-advance items and services may require reimbursement. In societies less advanced than ours, it’s not uncommon to read stories in worldwide media involving individuals being buried alive after the local authorities have incorrectly deemed them to be dead. The possibility of a premature burial occurring today in this country is nearly impossible, because a medical determination of death and a death certificate are requirements for burial. However, centuries ago, when comatose and unconscious individuals were not so easily distinguishable from the dead, it was possible for U.S. citizens to be buried alive. Consequently, so-called “safety coffins” were developed, which had devices (a string attached from the hand of the buried person to an aboveground bell) that would enable prematurely buried individuals to convey their status to passersby. Honoring the life of your loved one means you value the relationship you shared. We look forward to helping you decide how to celebrate that bond, and honor the unique person you’ve lost. To learn more about our funeral services, please call JAMES H. DELANEY & SON FUNERAL HOME at 668-1960, or visit us at 48 Common Street. We have been serving our community with pride for over six decades. There is no question that a discussion will take place during which all the details of your funeral and body disposition will be considered and decided upon. The only question is: Will you be taking part in the conversation? It certainly seems fitting that you do, when you consider that no one has a better understanding of your wishes and beliefs than you do. You also have a responsibility to take such personal matters into your own hands. Otherwise, those who love you most will be forced to make the decisions for you at a time when they are likely to have their thinking clouded by high emotion. Funeral prearrangement enables you to take a clear-headed approach to funeral planning. Dr. Elisabeth Kübler-Ross was a Swiss-American psychiatrist whose book On Death and Dying (1969) discussed her theory of the five stages of grief. The first of these, “denial,” helps individuals survive a loss that, initially, seems overwhelming. The second necessary stage of the grieving process is “anger,” which helps us dissipate pain. Fortunately, our anger subsides as we heal. Next, grieving individuals might engage in “bargaining,” which involves asking “what if” or declaring “if only” in attempts to make a pact with God to stave off death. Then, there is “depression,” in which our grief deepens. Finally, there is “acceptance.” While each stage is a necessary part of grieving, the order in which they are reached varies with each person. Jewish burial tradition calls for mourners to participate in the deceased’s burial by shoveling dirt on the casket. In doing so, the mourners are seen to be performing one final kindness for an individual who requires nothing more of them than the assurance of having his or her body honorably and properly buried. As might be expected, throwing dirt on the grave is more than a symbolic act. While it may be fraught with emotion and pain, this gesture goes a long way to bringing psychological benefit to surviving friends and family. Participating and witnessing the burial commits mourners to undergo one final loving act for their beloved departed and helps mitigate any illusion about the finality of death.